Print is within max machine dimensions but is still too tall? Posted February 24, 2016 · Print is within max machine dimensions but is still too tall? I am using an Ultimaker 2 Extended+ as my machine and my settings are the default settings for this machine. The max dimensions are 230 x 225 x 315 mm. My print is within the dimensions although it is close. Why is this print not able to be printed? Does it have to do with the printer head size? Thanks in advance for any help. First of all 305 is max height, not 315mm. But that is irrelevant to this issue. Try turning off brim and skirt (set to adhesion none and then skirt lines to zero) and see if it is happy then. I mean it should fit - it might be the clips that are somehow messing it up - the collision avoidance doesn't realize I believe that you won't hit the clips. You will have to do some weird stuff to get this to print - maybe tell the machine settings that your platform is actually some larger dimensions - or tell cura somehow that it is not a UM2extended but that it has the dimensions 223x223x305 (the official dimensions on the UM web page). Play around with cura a bit. I changed the max dimensions to 223x223x305 and it would not work but at 224x224x305 it will now print. Will extending the width and depth dimensions 1 mm past the actual dimensions effect the print or should this be fine? Because you are pushing the limits you need to know a few things. Every UM2 is a little different. For example the Olsson block decreases the height by maybe 2mm. If the fan shroud is bent different it can hit the walls. Sometimes the limit switch gets hit early and you have less space on one side and moving the limit switch by 1mm can make a difference (just bend the arm a little). So you need to find out what the actual build volume is for your particular printer and write it down. So install pronterface on a PC or mac - preferably a laptop because you need to connect the PC to your printer through a usb cable (you can always pick up the whole printer and bring it to the computer). That moves X axis to position 100. Then go to 200 and then move 1mm at a time until the head stops moving and the belt starts tightening. go further until the stepper skips. Note where the head stops moving *and* where the stepper skips a step. If the head skips a step you basically ruin your print. If the head stops moving you get a flat spot on that side of the print. Repeat for X,Y,Z axes. Anytime you skip a step rehome that axis (or all axes). Consider modifications to get a little more space. If you change your leveling position (e.g. by putting in a larger nozzle) then you will change your Z height also. If you bend the X or Y home switch a bit you can also alter your space a little possibly. Or if you can bend in your fan shroud a bit. Please report back on how much your maximum space ended up being! Posted February 26, 2016 · Print is within max machine dimensions but is still too tall? Thank you so much for the detailed and helpful response. I have been trying to find the correct USB cord that would allow me to connect to the printer but unfortunately where I am working does not have it. We do all of our prints through an SDHC card. Do you know of another way that I could find the true maximum dimensions of my printer? If someone has an old desktop printer - many of those have the correct cable. Also I believe all UM printers come with the correct cable in the box. Or you can spend the $3 or so and get one on amazon or ebay. Posted February 27, 2016 (edited) · Print is within max machine dimensions but is still too tall? I decided to test the print and watch it closely to see if it encountered any problems. I had to cancel it after less than 10 minutes. On the right side, the fans were bumping into the wall. On the front side, the extruder hit the endblock. The attached photos show what happened to the print as a result. There was extra space on the opposite sides (left and back) though so it seems that the extruder is slightly off center. I tried homing the extruder but I printed again and got the same result. I have not tried bending the trigger switches yet, but based on the photos, do you think it could make enough of a difference that the print would work? Also, do you have any other suggestions for what could fix this? I have access to 3 other Ultimaker 2 extended printers so if every UM2 is different, do you think it might work on one of those? Posted February 29, 2016 · Print is within max machine dimensions but is still too tall? With power off, push the head until you hear the click of the endstop switch. Then see how much farther the head will go - that's how much room you have to spare. I'm guessing no more than 3mm but who knows? Do the same with the Y axis. This experiment should take you all of 10 seconds. Bending the limit switches with pliers should take no more than 5 minutes but it's not worth it if you only gain 1/2mm. Posted March 1, 2016 · Print is within max machine dimensions but is still too tall? So I finally got a USB cord to connect to the printer and it seems that the center location is off. I center the head using the center button in pronterface. I can move 100 mm in the -x direction and 95 mm in the -y direction. My total movement in x is 225 mm and my total movement in y is 224 mm so the center is a significant distance off. How can I change what the Ultimaker recognizes as the center of my print? Posted March 2, 2016 · Print is within max machine dimensions but is still too tall? Well your nozzle is to the left so that's expected. And see if you can then cut power and push them a little farther than that (or just cut power to servos - there is a gcode for that. If Cura isn't putting the part in the center of the printable area (according to servos - not according to where the glass is) then that's a very serious bug - but I really doubt that's an issue. 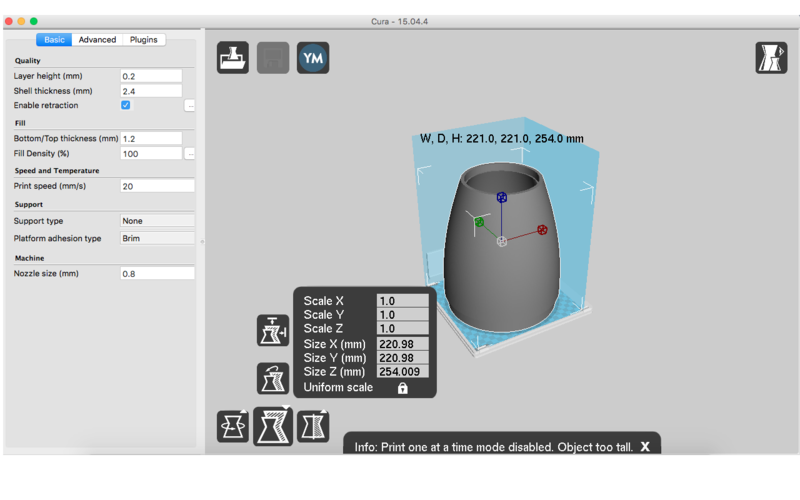 But you can always move a part in cura (as well as scale it, rotate it, and more).